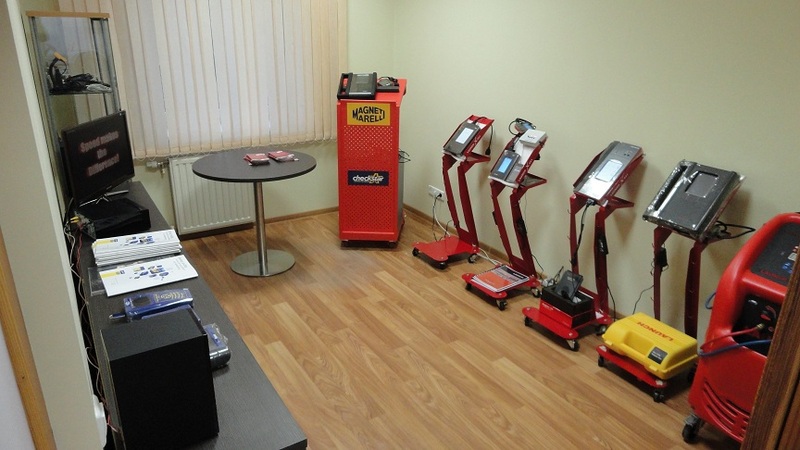 The company was founded in the year 1999, and its main activity was the installation of alarm systems and equipment for audio, repair of installation and electronics of vehicles and work with auto diagnostic equipment. In 2002, the company received the new name Della Motors, with service and office located in the Riga, Latvia. Since year 2004, the company, based on its knowledge of the vehicle electronic systems, begins work with diagnostic equipment and tool sales successfully. In this time the company received from several manufacturers distribution rights and has successfuly developed. From 2010 it was decided to concentrate on the high quality services of new direction and was opened new office in Latvia with the name Diagtools LTD with professional staff. In the spring of the year 2013 was opened new our company in the Spain with name Diagtools, S.L. From year 2014, we are also the official dealer in Spain of the AUTOCOM AB (http://autocom.se/en/contact) and other manufacturers. To pay for goods at your request we send invoice an email, fax or mail. You can also pay in cash or credit card in our office. Payment always due upon prepayment. After receiving of funds in our bank account or cash prepayment in our office, you can get the goods, if they are in the stock, or make sales-purchase contract for the supply of goods with us. For companies of EU countries with valid and verificated VAT number we can submit an invoice without VAT (not for individual persons). We send products to any country in Europe Union (all production), including to other countries out of the borderlines of EU (except of bulky goods), specified in advance. After the payment we will as soon as possible will send the goods by specified delivery way. Delivery of goods that are not in the stock, is carried out within time limit specified in the previosly signed sales contract. Usually it is during up to 3 weeks, unless stated otherwise in the sales contract. The goods are delivered by airmail, courier services (UPS, DHL, Feedex), or by self pickup, with your autorised agent or transport company. The goods can be delivered also with optional express delivery (by express courier services). Our guarantees is our good name and valued reputation. Our company is operating on the market more than 18 years (since year 1999), and we value our good reputation. For all our products we provide warranty and postwarranty services. If you will not be satisfied with the adquised product, within 14 days you can exchange it to other one with similar valor or more expensive, in this case with additional payment. In this case you always must have an objective reason, will be excluded worn or damaged parts, supply materials, etc., as well as inicialized software subscriptions, all that can significantly reduce the valor of the product. It will be always substantiated by our technical service in autorised our service center or by autorised agent and will be provided the detailed report.